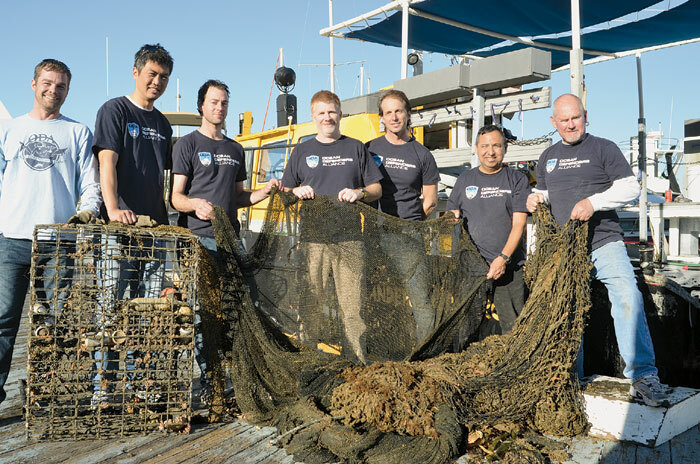 HUNTINGTON BEACH — Just before Christmas, 59-year-old Chicago native Kurt Lieber set out on another mission with his Ocean Defenders Alliance crew, with a plan to attack and remove hundreds of feet of fishing net stuck 62 feet below the surface off Huntington Beach’s coastline. The net was one of hundreds lost at sea by various commercial fishing vessels over the years. Once a net is detached from a fishing vessel, its main function to catch fish for profit turns to catching fish and killing them for no gain. The net in Huntington Beach, like so many others, was set loose by a commercial fishing vessel after it caught on an artificial reef. Lieber, who has been diving since 1974, decided to do something about these nets and formed the nonprofit Ocean Defenders Alliance — to remove discarded nets, lost lobster traps and other harmful marine debris from the ocean. Since its formation in 2004, Ocean Defenders Alliance has removed more than 11 tons of “ghost fishing” nets and loose lobster traps along California’s coast. For the Huntington Beach dive, Lieber set out with eight volunteer divers to tackle the hundreds of feet of tangled net at the site, utilizing his 40-foot vessel Clearwater for the trip and using dive equipment donated by L.A. Scuba Diving, a local dive training company. However, when the group reached the site that day, visibility was almost zero — and Lieber called off the dive. “Visibility was so bad that the divers couldn’t see their gauges in front of their faces,” Lieber said. But the canceled dive was just a setback, and Lieber quickly rescheduled another date for the attempt to recover the lost net. The Log caught up with Lieber to find out what inspired the formation of Ocean Defenders Alliance (ODA) and what he thinks the future holds. The Log: You had to reschedule your initial dive off Huntington Beach. How did it go? Kurt Lieber: “On our first day out to remove the net (on the initial dive), we were greeted by flat seas and excellent surface conditions, despite the rainstorms we had a week before. But when our divers got down to the site, they couldn’t see their hands in front of their faces. The Log: What got you into diving for marine debris that is harming wildlife? Lieber: “Marine debris is a huge issue — not just off the California coast, but also around the globe. This really is a case where the problem and the resulting marine animal deaths are “out of sight, out of mind” for most people. “I’ve always been a nature lover and have done lots of backpacking in our forests and national parks. When I see trash in those pristine areas, I remove it. Same thing on my dives. “What would you do if you saw a shopping cart in the Sequoias? In Yosemite? Or Yellowstone? I wouldn’t hesitate, and I always do all I can to remove garbage from these places. “Lobster traps and nets on the ocean floor are the same, only they are much worse for the underwater environment. They are deadly. They can continue to kill marine animals — mostly lobsters and crabs, but I’ve found sand bass, garibaldi, cabezon and even halibut in them. “Nets are another scourge to marine wildlife. Most fishing nets today are made of plastic and, as I’ve said, are toxic to the animals. In addition to being toxic to many forms of life, they can continue killing for centuries. The Log: What benefits do you see from your dives? Lieber: “Because there are so many sites out there for us to clean up, we don’t often go back to previous sites to see what has happened over time. However, the few locations we have tracked over time show significant positive improvement. “Two of the wrecks we’ve cleaned up, the Olympic and the African Queen, now have large fish on site. We are seeing lingcod and wolf eels there, where there were none before. Also, the benthic life is more robust, with lots more gorgonians (a type of sea fan), anemones and nudibranchs. “Another site we’ve been working on for years is the wreck of the Infidel. It lies in 150 feet of water on the south end of Catalina Island. It was a commercial squid boat that went down in 2006, with the net fully deployed and filled with thousands of pounds of squid. The Log: What is the most rewarding part of the job? Lieber: “In addition to seeing life start to return to our project sites, I am continually amazed at how our volunteers respond to this hard and potentially dangerous work. “In addition, I give lots of ODA presentations throughout California, and I find a lot of people want to help; they just don’t know how. Some folks help by donating to cover our expenses — ship fuel is expensive — while others help more directly. The Log: What keeps you motivated in the task? The Log: What’s next on the agenda? The Log: What can boaters and anglers do to help? Lieber: “The best thing to keep in mind as we enjoy our oceans is: We have to be better stewards. Clean up after yourself. Don’t leave gear behind. Remove debris when you can.